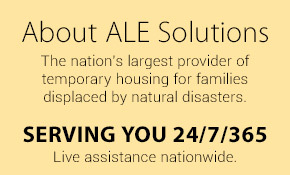 At ALE Housing Solutions, we are on-call and responding quickly and effectively 24/7/365 to ensure our customers and displaced policyholders get the most appropriate housing as soon as possible. As you can imagine, there is quite a bit of work that goes on behind the scenes to successfully and timely accommodate policyholders when disasters strike. Temporary housing is our business, and we have structured our rapid response communications and housing processes to keep up with demand. Every step of the way, ALE provides a single point of contact to both insurance adjusters and policyholders throughout the temporary housing stay (be it two weeks or a year). And, ALE pays all covered housing expenses on behalf of policyholders and is repaid directly by their insurance companies. Call or Click: A Claim Representative contacts ALE’s convenient hotel hotline (866) 587-1395 or visits the MyALE web portal to provide policyholder and claim information. Rapid Response: ALE contacts the policyholder immediately, confirms the family’s needs, and explains the relocation process. 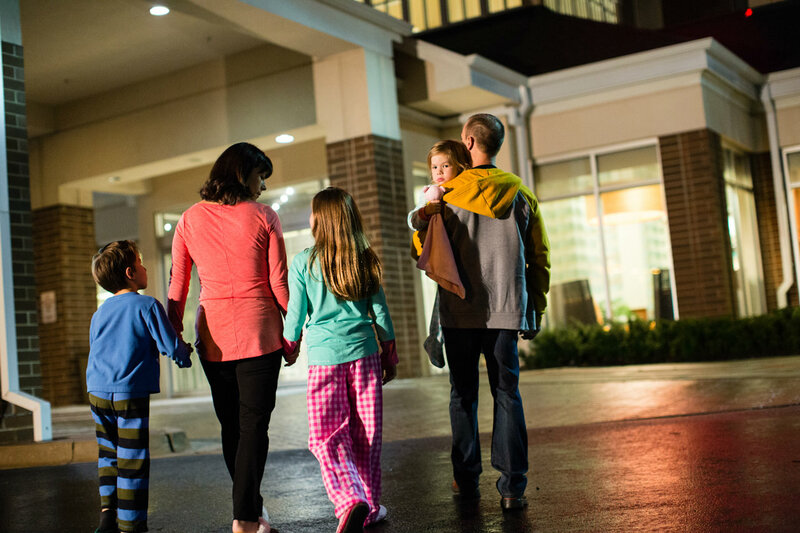 Search: ALE presents the most cost-effective accommodations (often a hotel) that meet the policyholder’s needs. Secure and Pay: ALE coordinates all necessary paperwork and secures rooms and payment on the policyholder’s behalf. Check-In: The policyholder selects the accommodations and upon check-in authorizes ALE to direct-bill the insurance company. Confirmation: ALE provides the Claim Representative with details of policyholder accommodations, including daily costs. Extensions: ALE regularly communicates with the Claim Representative to obtain and handle any necessary extension approvals. Invoice: Once a policyholder checks out, ALE reviews the hotel folio for accuracy and sends an invoice to the insurance company. After the policyholder settles into short-term housing, finding long-term housing is often a necessity based on the level of damage to a policyholder’s permanent residence. At this point, ALE’s Long-Term Housing department takes over the claim. Search: Utilizing our robust database, ALE searches for properties matching the policyholder’s unique needs and presents the most cost-effective accommodations. ALE then coordinates a property viewing between the policyholder and landlord. Secure and Pay: ALE manages and coordinates all signing of paperwork between the policyholder and landlord. The policyholder authorizes ALE to direct-bill the insurance company, and ALE advances all necessary funds to the landlord. Move-In: ALE orders and coordinates delivery of all furniture, housewares, and appliances to the temporary residence. The policyholder then moves in. Fulfillment: ALE contacts the policyholder to ensure the move and all house goods met their expectations. Invoice: ALE sends an invoice to the Claim Representative for the total costs of the policyholder’s housing, including the security deposit (if applicable). Extensions or Notice: 45 days before the lease ends, ALE contacts the Claim Representative to understand the progress of repair to the policyholder’s permanent residence. ALE then handles either move-out or extension paperwork on behalf of the policyholder. Move-Out: ALE coordinates the return of the policyholder’s security deposit with the landlord and reiterates final move-out tasks with the policyholder. 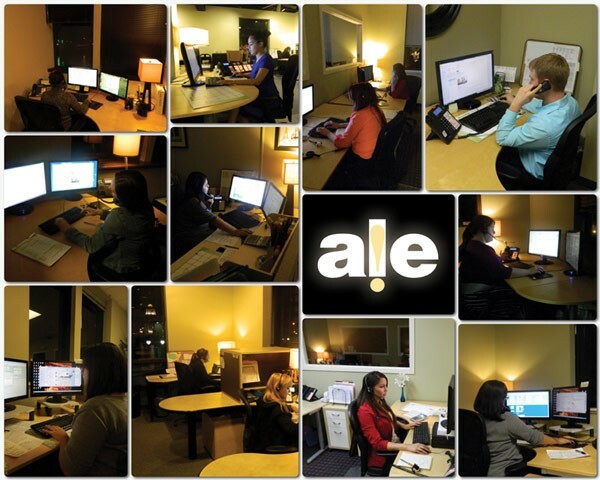 ALE Solutions is always here for you! Should you need us, or if you would like to find out more about temporary housing and rapid response, please contact us; we are your resident expert.